MachineMetrics Launches Industry's First AI-Driven Remote Machine Monitoring Solution at IMTS 2018. Data from thousands of connected machines allow the MachineMetrics Data Science team to work with service teams to identify trends and develop standard preventative maintenance and repair schedules that benefit both the service team and the customers. MachineMetrics is answering these questions with the release of their latest application: MachineMetrics Service. 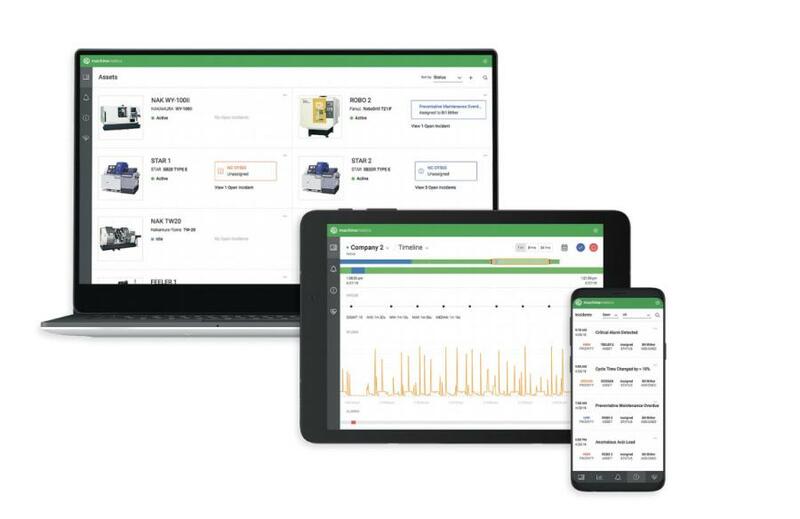 MachineMetrics Service is the industry's first AI-driven remote machine monitoring solution designed for OEM's and Equipment providers; a predictive analytics application on the MachineMetrics Industrial IoT platform that allows service teams to remotely monitor and manage machine assets in the field and at customer sites in real-time. Using MachineMetrics Service, equipment manufacturers can transform their approach to service with the ability to see, understand and take action on their customer's real-time machine data from anywhere at any time. With MachineMetrics Service, any machine maker or distributor can improve their customer service by resolving machine problems without the necessity of an on-site visit. Service managers and technicians can remotely monitor, manage, diagnose and resolve customer's machine issues for any piece of connected equipment in the field and in real-time using MachineMetrics cellular edge device. The historical and real-time machine data collected allows equipment manufacturers to gain insight into customers' equipment health and condition, identify new service opportunities with analytics and reporting, predict and deliver early warning of potential equipment failures, highlight elevated risk areas that lead to machine downtime, or even determine to take preventative action before it impacts a customer's machine performance. Any equipment provider, OEM or distributor, can install MachineMetrics Edge device on a new machine sold to a customer or retrofit any machine currently in the field. MachineMetrics Edge has the ability to connect to the machine's PLC and any additional sensors into the electrical cabinet of the machine and allows for the data to be shared with the equipment provider. There's no need to install on customer's internal IT infrastructure as MachineMetrics Edge comes with included cellular support. Once installed, the provider can add the device to a list of machine assets accessible via the MachineMetrics Service app and associate that machine with the location of the customer. Once the customer receives the machine and powers it on, that machine will appear active on the provider's list of assets. The MachineMetrics analytics engine will monitor any connected machine's conditions and other manufacturing data points and initiate an action, such as text notifications when a monitor is triggered such as an alarm state, a limit being exceeded, or any other anomaly in the machine's health is detected. A rules engine is provided for deploying monitors based on machine condition data and patent pending advanced machine learning algorithms can be deployed for detecting anomalous behavior. MachineMetrics Service will be on display at next week's International Manufacturing Technology Show in Chicago, the world's largest manufacturing trade show, in the MachineMetrics booth (East Building, Level 3, Booth #133108). MachineMetrics is a manufacturing analytics platform for discrete manufacturers. Their Industry 4.0-ready solutions work out-of-the-box to increase productivity through edge connectivity, real-time visibility, deep manufacturing analytics and AI driven predictive notifications. MachineMetrics has simplified Industrial IoT to digitize the shop floor and enable teams to drive decisions with machine data.